Mumbai, Oct 11 : Former union minister and senior Congress leader P. Chidambaram on Saturday it is extremely unfortunate that within the last three weeks a number of people have rubbished Maharashtra's achievements and urged the people to respond aggressively to such unwarranted statements. "Maharashtra is amongst the leading states in India. In fact, on many parameters this is the number one state. It's unfortunate and sad that in the last two or three weeks a number of people have rubbished Maharashtra's achievements. Such statements are not only unfortunate but also condemnable in strongest terms," Chidambaram said during a press conference here. New Delhi: The CBI will investigate the circumstances of the FIPB approval given by the then Finance Minister P Chidambaram in the Aircel-Maxis deal in 2006. The agency told a special court in its chargesheet in the case that Mauritius-based M/s Global Communication Services Holdings Ltd, a subsidiary of Maxis, had sought approval for USD 800 million for which Cabinet Committee on Economic Affairs (CCEA) was competent to do so. New Delhi: Former Finance Minister P Chidambaram on Friday favoured downsizing of the Planning Commission amid reports that Narendra Modi government is likely to dismantle or at least drastically reduce the over-arching role of the plan body. "My personal view is that the Planning Commission should be a much more limited body tasked with drawing up prospective plans. At the moment it is too big, flabby and unwieldy," Chidambaram, who is also senior spokesperson of Congress, said at the AICC briefing. He made the remarks while responding to a question about the new government's plan to prune the Planning Commission. New Delhi, May 13 - Finance Minister P Chidambaram has asked state-run insurers to increase their market share and stressed the need to enhance insurance penetration to attain global levels in a reasonable time frame. In a review meeting with the heads of public sector insurance companies here yesterday, he asked them to ensure no further market share was lost and the current level of 53 per cent was maintained and steadily improved upon. New Delhi, May 1 : India's economic growth is likely to accelerate to six percent in the current financial year from below five percent expansion registered in the previous two years, Finance Minister P. Chidambaram said Thursday. "Going forward 2014-15 will be better than 2013-14... 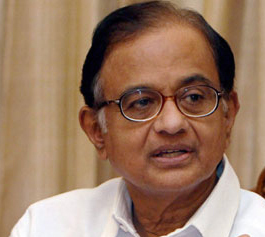 I think it's possible to aim and achieve six percent growth," Chidambaram said at a media conference here. However, he clarified that the government has not set any target for economic growth for the current financial year that began April 1. 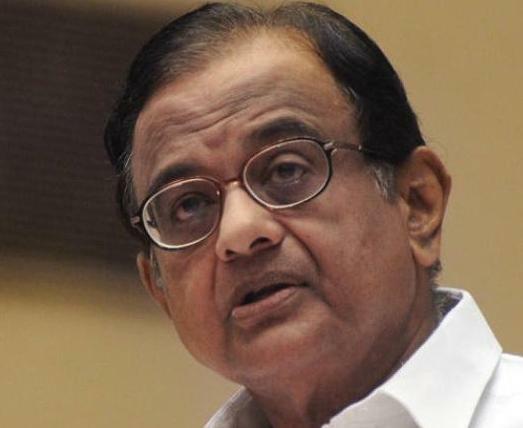 New Delhi, April 26 : Dismissing BJP prime ministerial candidate candidate Narendra Modi's claims of the Gujarat model of development's superiority, union Finance Minister P. Chidambaram Saturday termed the state "average" and expressed skepticism over the model's successful implementation elsewhere. Calling Gujarat an “average state” on the basis of indicators generally used to denote development, he told reporters that the state’s rankings based on these parameters were hardly stellar. New Delhi, April 26 : Finance Minister P. Chidambaram Saturday claimed that the economy is well on the path to recovery due to steps initiated by him during his term. Chidambaram said the fiscal deficit had been suitably contained. P. Chidambaram-led finance ministry has made some more changes in the Direct Tax Code draft bill that aims to replace the country's income tax act of 1961. In the revised DTC, the finance ministry has accepted 153 of 190 recommendations made by Yashwant Sinha-headed parliamentary standing committee on income tax. However, the finance ministry didn't accept the standing committee's recommendation that the limit of income tax exemption should be hiked to Rs 3 lakh and the remaining tax slabs should be relaxed. The Congress-led UPA government failed to meet its both the revised estimate and Budget estimate targets for fiscal deficit for the first 11 months of current financial year, fresh official data released by the Controller General of Accounts (CGA) revealed. According to newly released data, the difference between the government's revenue and expenditure in the first eleven month of 2013-14 touched 114 per cent of its revised target of Rs 5.24 lakh crore. New Delhi, March 31 : Finance Minister P. Chidambaram Monday said the Indian economy is more stable than it was 20 months back and the government is hopeful of meeting major macro-economic targets, including fiscal and current account deficits. “The economy today is far more stable and far stronger than it was 20 months ago,” Chidambaram said at a media conference here. “Nobody is talking about downgrades today,” he stressed. He said the country's current account deficit is estimated to come down to $35 billion in the 2013-14 financial year from a record high of $88 billion in the previous year. New Delhi, March 5 : Union Finance Minister P Chidambaram on Wednesday said that the biggest challenge before the public sector banks are the Non Performing Assets (NPA), and added that he has asked them to focus on NPA's recovery. Finance Minister P Chidambaram on Thursday inaugurated the country's first Post Office Savings Bank ATM service at Thiyagaraya Nagar Head Post Office (HPO) in Chennai. After launching the ATM, Mr. Chidambaram said that the Congress-led UPA government allocated Rs 4,909 crore for the modernisation of Department of Posts in the interim budget for financial year 2014-15. The cut of 2 per cent in excise duty on capital goods is expected to provide a short-term breather for the capital goods sector, which has been under stress for a prolonged period. On Monday, Finance Minister P. Chidambaram proposed a cut of 2 per cent in excise duty on capital goods, from 12 per cent to 10 per cent, in the interim budget for the financial year 2014-15. New Delhi, Feb 17 : India's fiscal deficit will be contained at 4.6 percent of the GDP in the current financial year and may ease further to 4.1 percent in 2014-15, Finance Minister P. Chidambaram said Monday. "The current financial year will end on a satisfactory note with the fiscal deficit at 4.6 percent (below the red line of 4.8 percent) and the revenue deficit at 3.3 percent," the finance minister said while presenting the interim budget for the fiscal 2014-15 in the Lok Sabha. New Delhi, Feb 17 : Indian automobile industry Monday welcomed Finance Minister P. Chidambaram's move to cut excise duty on several product types of the sector. "We believe this reduction in excise duty would reduce the acquisition price, thereby making vehicles more affordable - which would improve the consumer sentiment, and hopefully revive the demand for vehicles," Vikram Kirloskar, president, Society of Indian Manufacturers (SIAM), said. The Indian rupee slipped to hit more than 62 per US dollar in early morning trade on Monday, ahead of the presentation of interim budget by Finance Minister P. Chidambaram. The local currency was trading at 62.06 per US dollar on Monday, down from its close of 61.9250/9350 against the American currency on Friday last week. The country's equity benchmark BSE Sensex was trading 0.35 per cent higher at 20,438.87 points. New Delhi, Feb 17 : Finance Minister P. Chidambram Monday increased the budgetary support to the railways from Rs. 26,000 crore to RS. 29,000 crore in the interim budget for 2014-15. In his interim budget speech for 2014-15 presented to the Lok Sabha, Chidambaram said the government has to identify new instruments and new mechanisms to raise funds for railway projects. New Delhi, Feb 17 : Finance Minister P. Chidambaram Monday said merchandise exports during the current year will grow at 6.3 percent at $326 billion. According to Chidambaram, though the financial year 2013-14 began on a pessimistic note, it will end with estimated merchandise exports of $326 billion. He said exports from India have recovered sharply, in spite of the global trade declining from 6.1 percent in 2011 to 2.7 percent in 2013.